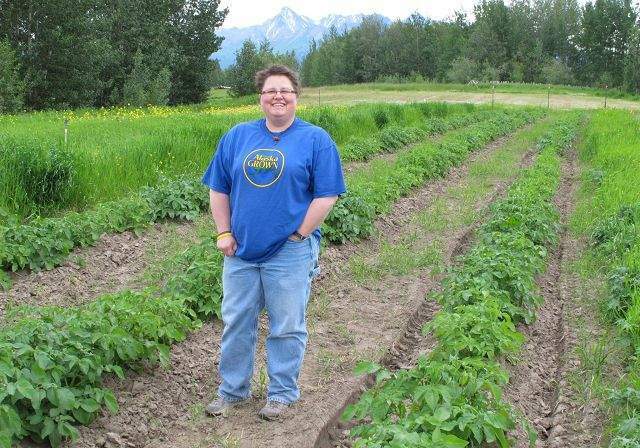 Jodie Anderson, a community horticulture director for the University of Alaska at Fairbanks, stands at the Matanuska Experiment Farm July 7 in Palmer, Alaska. Alaska has abundant natural resources, but soil isnt among them. To help Alaskans create their own dirt and grow gardens to supplement hunting, fishing and gathering, a modest federal grant is paying for five demonstration gardens from the Panhandle to the Arctic, using soil mixed from local sources. PALMER, Alaska  While Alaska has abundant natural resources, soil thats good for gardening isnt among them. To help residents create better dirt and grow vegetables to supplement their hunting, fishing and gathering, the University of Alaska at Fairbanks was given a federal grant to create demonstration gardens where soil will be mixed with local fertilizers. Those might include kelp from a Panhandle beach in southeast Alaska, ground-up salmon guts from Bristol Bay or peat from the abundant wetlands of Minto Flats in the states interior. The $48,500 grant is part of the $3 million that the U.S. Department of Agriculture spends each year on research and education intended to promote sustainable agriculture in 14 western states and U.S. protectorates. The grants often are used for programs that address the shallow soil found in Alaska and many other Western states, said Phil Rasmussen, who heads the USDA program in the West. The agency has provided money to compare planting techniques in dry New Mexico soils and to help Montana dairy farmers learn how to turn cow waste into compost and methane for energy. This year, farmers in Colorado, Idaho and Oregon will learn how to reduce their nitrogen fertilizer costs by growing forage, which usually is fed to animals, with plants that reduce need for the fertilizer. In Alaska, food often is prohibitively expensive, especially in areas off the road system. Stores, if they exist, are stocked with canned goods delivered by summer barges. Perishables are flown in. Though unlikely to ever provide enough food to live off year-round, rural gardens offer a valuable supplement to Alaskans diets, Jodie Anderson, a community horticulture director in Palmer, said. Leaf lettuce, carrots and crops such as cauliflower, cabbage and kale commonly are grown. Standing in the way are thin root zones, nutrient-poor soils and, as you move north, permafrost  ground that stays frozen year-round. Alaskas cold temperatures inhibit microbial activity, and low rainfall in many regions slows soil formation. Soil may contain volcanic ash or rock scraped from glaciers, but it often hasnt broken down chemically. There is good news, however. Abundant components exist to manufacture great soil, Anderson said. The grant will pay for five experienced rural gardeners each to build four raised beds. Two will be fertilized with local organics and two with synthetic fertilizer for comparison. Raised beds increase Alaskas cold soil temperature, lengthening the growing season and avoiding drainage problems from frozen soil. Soil recipes will vary by location. A camera crew will document soil building and produce two videos, one aimed at coastal villages and one for river villages, said Anderson. I hope this will teach people that they have all the soil components they need in their own area, and they can make their own garden soils, Anderson said. One common ingredient is sand. Another is fish waste, which can be composted and used to enhance soil. Rick Bellagh, who gardens on a southeast Alaska island near Juneau, starts with beach sand dug above the high saltwater line and then heads to the rain forest. He goes to areas where trees have naturally fallen, and where the soil is turned up, hell grab the really dark, organic material from that area, Anderson said. At Naknek on Alaskas southwest coast, Izetta Chambers, part of a family owned fish-processing company, produces compost from fish waste mixed with wood chips. Paul Apfelbeck of Galena lifts peat from the Yukon River, where its loosened during spring breakup by ice grinding the shoreline. A gardener in Minto on interior Alaskas Tanana River will amend soil with compost from leaves and other byproducts of the boreal forest, plus peat. A gardener above the Arctic Circle in Kotzebue likely will dip into bogs for peat and incorporate kelp and shells from the shore of Norton Sound, Anderson said. Potatoes were picked as the test crop, in part because they have a unique benefit in Alaska.